Last week, Instagram launched its most significant and talked-about new feature to date – Instagram Stories. This Instagram update allows users to share photos and videos in a slideshow format, which then disappear after 24 hours. Yes, you’re right, it does sound a lot like Snapchat. Over the past 18 months, Snapchat has been at the forefront of a shift towards ephemeral, transient posting on social media. In this new era of social media, content is no longer curated, edited and scheduled; it’s fleeting and constant and everywhere all the time. In the beginning, the instant video was brushed off as a micro-trend but the stats show that this is a force to be reckoned with. Snapchat boasts over 100 billion daily active users, with a staggering 10 billion snaps being viewed every 24 hours. Snapchat has quickly grown to become the third most popular social channel, creeping up just behind Instagram and Facebook. So it was really only a matter of time before other networks hopped on this digital bandwagon and got in on the interactive video action. 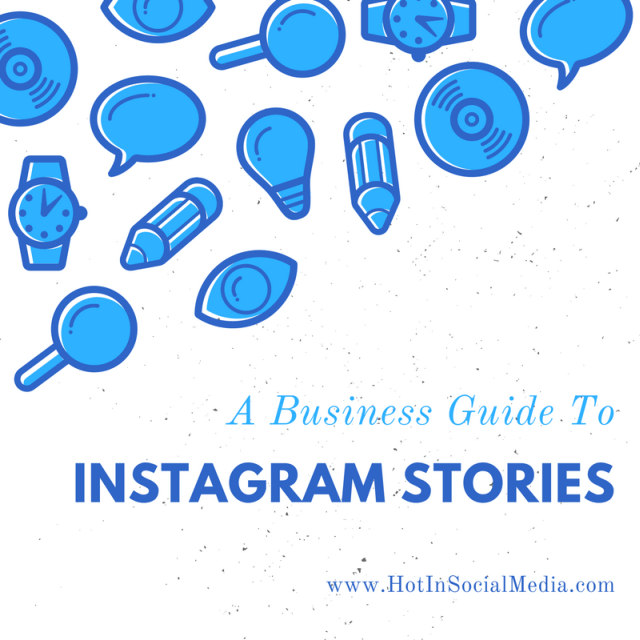 In this business guide to Instagram Stories, you will find everything you need to know to use your Instagram account to its maximum. Stories appear in a bar at the top of your Instagram feed and you can easily scroll through them. To add to your story, simply select the ‘plus’ symbol in the top left-hand corner. You can then record a video or take a snapshot and edit it with text or a finger drawings. Users can’t like or comment on your story but can send you direct messages. You can see exactly who has viewed your story. Swiping down on the Stories camera allows you to add content from your own camera roll. Content on Instagram Stories is separate from your existing curated feed. However, you can add a part of your Story to your feed by using the share button. Instagram Stories is housed within the existing Instagram app but its functionality makes it feel like another entirely new social media platform for business owners and marketers to get to grips with. It’s an exhausting thought when we’re struggling to juggle content on the few existing channels we already have. However, instant video marketing presents a list of potential benefits to businesses and brands of all sizes. Of course, big names like Nike have been trying out Instagram Stories, but many smaller companies have been giving it a go too. Beauty brands have been giving live makeup tutorials and restaurants have been offering behind the scenes tours of their kitchens. Instagram Stories allows you to be creative and add a new dynamic to your social media efforts. As Stories are separate from your existing feed, you can share more content than ever before, without fear of spamming your followers. The nature of Instagram Stories is authentic and all about the little moments, which means you save time when it comes to planning and editing photos to perfection. And of course, if your brand already has a following on Instagram, using the Stories feature is a bit of a no-brainer as it offers you another, more intimate and engaging way of connecting with your audience. You have the chance to enter the world of real-time video marketing without the stress of setting up and building a following on a new channel like Snapchat or YouTube. With live video, audiences tend to be more captive and you can use this to your advantage by taking them on a journey with your content. Office tours and product tutorials will give them more insight into the workings of your business and allow them to better understand what you do. Give them exclusive behind the scenes access that’s not visible on your other more polished social platforms. If you have a new product or service in the pipeline, you can tease this on Instagram Stories by showing your followers snippets of what’s to come. Give them flashes of new logos or branding. This privileged information will keep them intrigued and interested in your business. Instagram Stories is much more personal than the likes of Facebook or Twitter, as your followers will be able to see your face and hear your voice. It allows them to feel like they’re getting to know you. If you have some interesting personalities within your team, consider doing Q and A sessions with staff members, asking your followers to send in questions to boost that one-to-one interaction. To increase your followers on Instagram and heighten engagement among them, you can offer exclusive discounts or promotions to your audience. Providing voucher codes or running competitions solely for Instagram followers will give people reasons to follow you. Influencer marketing can be particularly effective through video. On Snapchat many brands have used this idea well. Glamour magazine, for example, allows celebrities too often take over their account for the day to diversify their content and keep followers guessing. If you have a niche brand or product, reach out to influencers in your industry to take over your Instagram Stories account. This can help to significantly increase your reach and will create a bit of buzz about your brand. With every new social media update, there comes some trial and error and it will take time for you to analyze what kind of content your audience best engages with. Regardless of what techniques you’re experimenting with, always focus on providing value to your audience. Even though posts are impermanent and more off-the-cuff on Instagram Stories, for you as a business this is still a content marketing channel and giving your audience what they want should always be a priority. Keep your content in line with the lighthearted tone of the channel. Be conversational and authentic and avoid heavy sales pitches. If you’re feeling unsure of your efforts, don’t be afraid to ask your followers for direct feedback. Ask them what they’d like to see more or less of; let them steer you in the right direction. Putting time and energy into another social media feature can seem daunting, especially when it’s so difficult to measure your return. However, instant video marketing is a long game. For many brands, it won’t instantly result in direct sales, leads or conversions but the engagement and loyalty you build through consistent posting could be invaluable. Lana Richardson is a journalist and digital marketer, specializing in content and social media marketing. Lana is the current blog editor for NIParcels.com and IrishParcels.ie.